"Rockies" redirects here. Rockies may also refer to the National League Baseball team, the Colorado Rockies. For the former National Hockey League team, see Colorado Rockies (NHL). For individual mountains named Rocky Mountain, see Rocky Mountain (disambiguation). The Rocky Mountains, often called the Rockies, are a broad mountain range in western North America. The Rocky Mountains stretch more than 3,000 miles (4,800 kilometers) from British Columbia, in Canada, to New Mexico, in the United States. 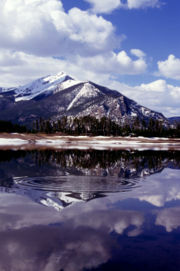 The highest peak is Mount Elbert, in Colorado, which is 14,440 feet (4,401 meters) above sea level. Mount Robson in British Columbia, at 12,972 feet (3,954 meters) is the highest peak in the Canadian Rockies. The Rocky Mountain System is a United States physiographic region. 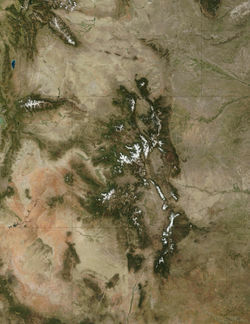 In the United States, the more impressive rises above the Great Plains includes the Front Range from northern Colorado to northern New Mexico, in Wyoming along the Wind River Range and Big Horn Mountains, and in Montana with the Crazy Mountains and along the Rocky Mountain Front which extends into extreme southwestern Alberta, Canada. The Wasatch Range near Salt Lake City, Utah divides the Great Basin from the mountains in the west. The Cathedral Group of the Teton Range in Grand Teton National Park, Wyoming. The Rocky Mountains are commonly defined to stretch from the Liard River in British Columbia, down to the Rio Grande in New Mexico. The mountains can also be considered to run all the way to Alaska or Mexico, but usually those mountains are considered to be part of the entire American cordillera, rather than part of the Rockies. 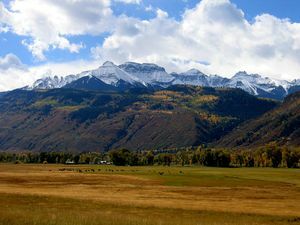 The younger ranges of the Rocky Mountains uplifted during the late Cretaceous period (100 million-65 million years ago), although some portions of the southern mountains date from uplifts during the Precambrian (3,980 million-600 million years ago). The mountains' geology is a complex of igneous and metamorphic rock; younger sedimentary rock occurs along the margins of the southern Rocky Mountains, and volcanic rock from the Tertiary (65 million-1.8 million years ago) occurs in the San Juan Mountains and in other areas. Millennia of severe erosion in the Wyoming Basin transformed intermountain basins into a relatively flat terrain. 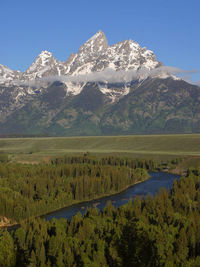 The Tetons and other north-central ranges contain folded and faulted rocks of Paleozoic and Mesozoic age draped above cores of Proterozoic and Archean igneous and metamorphic rocks ranging in age from 1.2 billion (e.g., Tetons) to more than 3.3 billion years ( Beartooth Mountains) (Peterson 1986; Knight 1994). Periods of glaciation occurred from the Pleistocene Epoch (1.8 million-70,000 years ago) to the Holocene Epoch (fewer than 11,000 years ago). Recent episodes included the Bull Lake Glaciation that began about 150,000 years ago and the Pinedale Glaciation that probably remained at full glaciation until 15,000-20,000 years ago (Pierce 1979). Ninety percent of Yellowstone National Park was covered by ice during the Pinedale Glaciation (Knight 1994). The "little ice age" was a period of glacial advance that lasted a few centuries from about 1550 to 1860. For example, the Agassiz and Jackson glaciers in Glacier National Park reached their most forward positions about 1860 during the little ice age (Grove 1990). 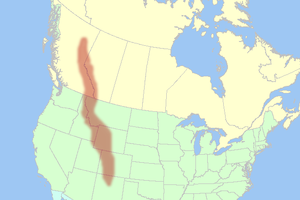 Map showing approximate location of the Rocky Mountains. The Continental Divide is located in the Rocky Mountains and designates the line at which waters flow either to the Atlantic or Pacific Oceans. Triple Divide Peak (8020 feet/2444 m) in Glacier National Park (US) is so named due to the fact that water which falls on the mountain reaches not only the Atlantic and Pacific, but the Arctic Ocean as well. Since the last great Ice Age, the Rocky Mountains were home first to Paleo-Indians and then to the Native American tribes of the Apache, Arapaho, Bannock, Blackfoot, Cheyenne, Crow. Flathead, Shoshoni, Sioux, Ute, and others (Johnson 1994). Paleo-Indians hunted the now-extinct mammoth and ancient bison (an animal 20% larger than modern bison) in the foothills and valleys of the mountains. Like the modern tribes that followed them, Paleo-Indians probably migrated to the plains in fall and winter for bison and to the mountains in spring and summer for fish, deer, elk, roots, and berries. In Colorado, along the crest of the Continental Divide, rock walls that Native Americans built for driving game date back 5,400-5,800 years (Buchholtz 1983). A growing body of scientific evidence indicates that Native Americans had significant effects on mammal populations by hunting and on vegetation patterns through deliberate burning (Kay 1994). Recent human history of the Rocky Mountains is one of more rapid change (Lavender 1975; Knight 1994). The Spanish explorer Francisco Vásquez de Coronado — with a group of soldiers, missionaries, and African slaves — marched into the Rocky Mountain region from the south in 1540. The introduction of the horse, metal tools, rifles, new diseases, and different cultures profoundly changed the Native American cultures. Native American populations were extirpated from most of their historical ranges by disease, warfare, habitat loss (eradication of the bison), and continued assaults on their culture. The Lewis and Clark Expedition (1804-1806) was the first scientific reconnaissance of the Rocky Mountains. Specimens were collected for contemporary botanists, zoologists, and geologists (Jackson 1962). The expedition was said to have paved the way to (and through) the Rocky Mountains for European-Americans from the East, although Lewis and Clark met at least 11 European-American mountain men during their travels. Mountain men, primarily French, Spanish, and British roamed the Rocky Mountains from 1720 to 1800 seeking mineral deposits and furs. The fur-trading Northwest Company established Rocky Mountain House as a trading post in what is now the Rocky Mountain foothills of Alberta in 1799, and their business rivals the Hudson's Bay Company established Acton House nearby. These posts served as bases for most European activity in the Canadian Rockies in the early 1800s, most notably the expeditions of David Thompson (explorer), the first European to follow the Columbia River to the Pacific Ocean. After 1802, American fur traders and explorers ushered in the first widespread white presence in the Rockies south of the 49th parallel. The more famous of these include Americans included William Henry Ashley, Jim Bridger, Kit Carson, John Colter, Thomas Fitzpatrick, Andrew Henry, and Jedediah Smith. On July 24, 1832, Benjamin Bonneville led the first wagon train across the Rocky Mountains by using Wyoming's South Pass. The Mormons began to settle near the Great Salt Lake in 1847. In 1859, gold was discovered near Cripple Creek, Colorado, and the regional economy of the Rocky Mountains was changed forever. The transcontinental railroad was completed in 1869, and Yellowstone National Park was established in 1872. While settlers filled the valleys and mining towns, conservation and preservation ethics began to take hold. President Harrison established several forest reserves in the Rocky Mountains in 1891-1892. In 1905, President Theodore Roosevelt extended the Medicine Bow Forest Reserve to include the area now managed as Rocky Mountain National Park (Buchholtz 1983). Economic development began to centre on mining, forestry, agriculture, and recreation, as well as on the service industries that support them (Lavender 1975). Tents and camps became ranches and farms, forts and train stations became towns, and some towns became cities. Economic resources of the Rocky Mountains are varied and abundant. Minerals found in the Rocky Mountains include significant deposits of copper, gold, lead, molybdenum, silver, tungsten, and zinc. The Wyoming Basin and several smaller areas contain significant reserves of coal, natural gas, oil shale, and petroleum. For example, the Climax mine, located near Leadville, Colorado, was the largest producer of Molybdenum in the world. Molybdenum is used in heat-resistant steel in such things as cars and planes. The Climax mine employed over 3,000 workers. The Coeur d’Alene mine of northern Idaho produces silver, lead, and zinc. Canada's largest coal mines are in the Crowsnest Pass near Sparwood, British Columbia and Elkford, British Columbia; additional coal mines exist near Hinton, Alberta. Abandoned mines with their wakes of mine tailings and toxic wastes dot the Rocky Mountain landscape. In one major example, eighty years of zinc mining profoundly polluted the river and bank near Eagle River in north-central Colorado. High concentrations of the metal carried by spring runoff harmed algae, moss, and trout populations. An economic analysis of mining effects at this site revealed declining property values, degraded water quality, and the loss of recreational opportunities. The analysis also revealed that cleanup of the river could yield $2.3 million in additional revenue from recreation. In 1983, the former owner of the zinc mine was sued by the Colorado Attorney General for the $4.8 million cleanup costs; 5 years later, ecological recovery was considerable (Brandt 1993). Agriculture and forestry are major industries. Agriculture includes dryland and irrigated farming and livestock grazing. Livestock are frequently moved between high-elevation summer pastures and low-elevation winter pastures, a practice known as transhumance. 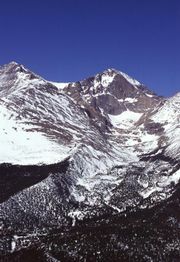 Snowpack accumulation at 14,255 ft. on Longs Peak in Rocky Mountain National Park (photo courtesy of USDA). The adjacent Columbia Mountains in British Columbia and Idaho contain major resorts such as Schweitzer, Panorama and Kicking Horse. The Rocky Mountains prevent the Wasatch Front metropolitan area of Utah from expanding eastward.